Hello! Ruth Brown here. Main character in Linda's trilogy about me during my days as a War Correspondent. She's asked me to share a bit about my initial reactions to London. I landed here in 1942 when I followed clues about my sister's disappearance. First of all, it was a LOT different than anything I ever experienced. I was born and raised in a village on the shores of Lake Winnipesaukee. 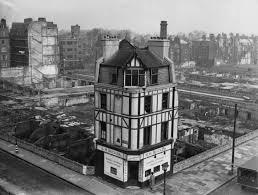 London is estimated to have had nearly nine million inhabitants in 1939. My tiny hometown has never had more than twenty five hundred citizens. The number of buildings, people, trains, cars and trucks (despite gas rationing-or petrol as the Brits called it) was overwhelming. I don't have a good sense of direction, so the lack of signage created a big challenge. There was grave concern the Germans could cross the Channel and invade at anytime, so street signs were removed to prevent them from finding their way around the country. I got lost on a regular basis! 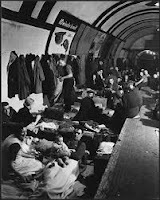 Because of all the damage caused during the Blitz, many of the Tube stations were out of commission. 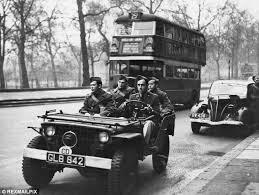 Schedules were hit and miss because of continuing air raids. The buses were the best way to go, but were often so crowded you had to wait for the next one. I put a lot of miles on my shoes. Good thing I brought two pair of sturdy oxfords with me, since replacements were tough to find and used a lot of ration points. What impressed me the most was the citizens' ability to carry on during the war. Shortages of food and supplies, and the constant uncertainty was wearing. Yet, they soldiered on-going to work, managing their families and their gardens, with their ever-present gas mask at their side. I'll never be the same having lived side by side with these courageous people.